[NOV. 9, 2002] The Lincoln Christian College Preachers continued their solid play Friday, winning their afternoon game against Trinity Baptist from Jacksonville, Fla. The Preachers led by 20 at halftime and won 104-71. Coach Kirk believes Lincoln simply won with better athletes. He was pleased with the balanced scoring, as five players scored in double figures, and hopes that it will last through the season. The Cincinnati Bible College Tip-Off Classic ends Saturday. LCC faces Toccoa Falls at 2 p.m. Correction note: Joel Searby scored 22 points as the top scorer for LCC in Thursday’s game with Kentucky Christian College. [NOV. 9, 2002] Canton - After taking a 37-32 half-time lead, Lincoln College managed only 27 second half points and went down to defeat at the hands of Rend Lake, 66-64, here Friday night. The Lynx, 1-3, will play in Canton again Saturday against Shawnee at 2 p.m.
James Roberson and Terrance Chapman both scored 19 points to lead Lincoln College with Josh Clark also reaching double figures with 13. Lawrence Barnes took game scoring honors with 20 points for Rend Lake. Lincoln College shot just 24 percent the second half (10-41), while Spoon River hit at a 54 percent clip (13-24). For the game the Lynx shot at a 33 percent clip and made just 4 of 23 shots from three point land., Rend Lake finished the game with a 46 percent shooting average. The Lynx also had a huge rebounding advantage, 57-36, with Chapman pulling down a game high of 18. Lincoln College (64) - Josh Clark 5-13-2-3-13, Jeff Carlson 0-1-0-0-0, Michael Fowler 1-4-0-0-2, Rueben Trotter 3-7-1-2-7, Loyd Bowen 0-0-0-0-0, Amir Major 1-5-0-0-2, James Roberson 8-18-0-0-19, Terrance Chapman 7-25-5-11-19, Derik Hollyfield 1-5-0-0-2, Rian Lazzerini 0-0-0-1-0. Totals - 26-78-8-17-64. Three point goals - Clark, Roberson 3. Rend Lake (66) - Matt Miller 5-11-1-2-13, Lawrence Barnes 8-15-3-7-20, Terrance Smith 1-3-0-0-2, Shane Garner 0-3-0-0-0, Drew Porter 5-9-0-0-11, Joel Jaye 6-12-0-0-12, Matt Jarrett 1-4-2-3-4, Justin Hill 1-2-2-2-4. Totals - 27-59-8-14-66. Three point goals - Miller 2, Barnes, Porter. Do you have any suggestions for non-credit Community Education classes in Lincoln? Would you be interested in teaching a Community Education class in Lincoln? with your suggestions or contact information. My coach of the week could very easily be my coach of the year, and that is none other than LCHS head football coach John Oaks! 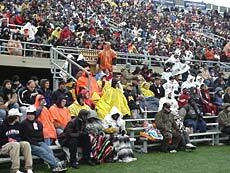 Coach Oaks told me and a LIVE TV audience on "FANdamonium" BEFORE the season began that he had high hopes and high expectations for his gridders. They reached several of those lofty dreams and goals. It took some of the hardest work and patience that you can ever imagine, but this man and his team got the job done and turned in what I believe is the best record in some 11 years. And that’s not the half of it! The freshmen may have had their best season ever, or at least one for the ages, as well. And the sophomores had their moments too! I’m compelled to give John and his staff the award as just a grateful fan. Thanks, you guys, for beginning to restore some of the pride back into the program. Perhaps this season will serve as a launching pad to greatness! The LDN salutes you! Staying with this same theme, I’m picking the Lincoln High School football team (on all levels) as my team of the week. Seldom will you see me reward a team on this side of the ledger, but you have to start somewhere. And this is a special team. First of all, I commend EVERY kid who just stuck it out! Especially those of you who went through it all for four years! And then to all of you who talked your friends into going out for the team. And then to you guys who went out amidst pressure NOT to do so from friends, family or whoever. You guys showed what hard work, determination and teamwork can do when no one cares who gets the glory! Hopefully our city and county officials are getting a glimpse of this picture. At any rate, we here at the LDN salute your performance, and we’re proud of your accomplishments. May those of you who return next year, pick up the baton and head straight for the playoffs! The LDN wants to take this opportunity to extend condolences to the family of coach Ed Butkovich. Coach had some exciting days and I believe has at least one Class A state title in his rich legacy. He was especially good to me in my early days as the coach out at LCC. He allowed his players to come to our summer camp. (You might be surprised that SOME coaches don’t let their kids come to our camp or any camp other than their own for that matter. I can STILL remember the scathing letter I received from one of the coaches from Jacksonville, questioning the methods I employed. History shows that some of the kids from THAT area needed more than just ONE week of our camp experience… BUT I won’t go into that now. Let me just say that our graduates went on to win many A and AA regional, sectional and a few state titles. I THINK that speaks for itself). Anyway, coaches Butkovich and Rucks and Gasaway and others in Mount Pulaski always supported me and my program, and I’ll never forget that. I will always be loyal and grateful for that kind of friendship, especially when it comes from an unexpected source like that. Other area teams had and have just as much at stake and have every opportunity to be supportive of LCC and other area colleges but choose to focus solely on themselves. That is their option. I’m glad coach Butkovich wasn’t like that. He came as a favor to watch my teams practice every year and then offered me tremendous insights and suggestions. If you don’t know much about basketball, let me just say that few things could be worth more to you than having someone with his expertise helping someone like me who was REALLY struggling at the time. And more than that, Ed was just a good guy. Whenever I saw him in public, he always had a kind or gracious word for me. I was sad and stunned to hear the news of his passing. He was an icon in and for this area. Thank you, Coach, for what you meant to me and for countless others. Godspeed! Yes. The Bears had another chance to win a game in the waning moments. And unlike last year, when no matter who threw the ball it would always end up in a Bear’s hands, that’s NOT the case this year! The thing that this reporter is amazed by is that whenever a Bears coach states that he’s content to always have at least a chance, I have to ask, "What???" I don’t want just a CHANCE. If I can kick the tar out of you and win by two or three touchdowns, that’s what I’m going to do (my apologies to those of you who thought I was a nice guy). Take for instance the score tied in the fourth quarter with the Bears possessing the ball just inside their 20-yard line. They run a pitch or a toss play that they’ve run six to eight times already during the game (which begs the question, is their playbook really THAT small?). On top of that, they try to run it this time to a wide-out. Is it just my imagination or are wide-outs suppose to run down the field and catch passes? When you run something like that you deserve to fumble and lose the game. I will never be able to figure out that kind of stuff! Even just before half they ran some vertical passing offense and were able to jet down the field in less than a minute in time to get a last-second 53-yard FG from Paul Ettinger! I realize that the zone was a little softer in that situation, but do we KNOW that for sure? There was no attempt to go back to that except in third and long situations and in desperation mode. On the other hand, I did feel that the Bears defense played well. With the exception of two or three runs by Donovan McNabb (and folks, this guy’s going to break away every once in a while; he’s just that good), the Bears held them in check. 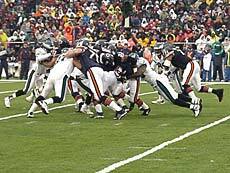 Great pursuit by Urlacher and others gave the Bears at least a CHANCE to win (I STILL don’t like that phrase!). But when the offense didn’t put up even positive yardage in the second half until the last desperation drive, that’s what happens. I know the schedule is tougher this season, but I’m just not sure this group can get it done. Click here for more Bears photos. Our own Greg Taylor tried to help Illini coach Ron Turner. Greg suggested that coach Turner stick with QB Jon Buetjer, but Turner didn’t, and by the time Jon was inserted into the game he didn’t have enough time to incite a comeback, as the Illini dropped an 18-7 ugly one to Penn State! And what’s up with the tackling? Or lack thereof? I haven’t seen such sloppy technique since guys used to run over me!!! My mom used to say not to say anything if you can’t say something nice… THEREFORE, this subject matter is closed!!! The Lady Railer volleyball girls just keep winning. Now they will travel to Rantoul for a Tuesday night showdown with who we believe will be the Champaign Central Chargers at 6:30. Good luck, ladies! That’s the only other sports news that’s been turned over to me. If you’ve got something else, get it to us as quick as you can. You can reach us at ldneditor@lincolndailynews.com. Tonight our guests include the LCHS swimmers of George and Ruth Sloot, fresh off a fourth-place finish at the CS8 meet. Illini assistant coach Billy Gillespie has accepted the head coaching position at UTEP. I hate to see him go! Why didn’t Illinois give Donovan McNabb a better recruiting pitch when he was in high school? Lincoln’s Brian Cook and Jerrance Howard will have to miss the first two games of the season because of playing in a non-sanctioned summer tourney. Don’t get me started with the NCAA and the IHSA again… Let’s just leave it alone!!! Lincoln’s Greg Alexander and his ISU Redbirds get things started tonight versus SIU-E at 7:05 in Normal. Plenty of good seats STILL available!!! LCC opens their season this weekend with a tourney in Cincinnati. LC dropped two tough ones on the road in their openers.